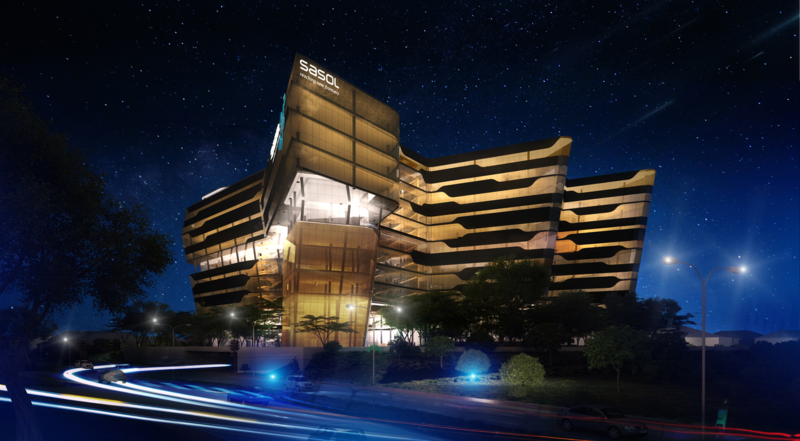 Sasol's Logo-Inspired Design - future space in Sandton. Sasol’s Ultramodern Future Space in Sandton. Image courtesy of Paragon Architects. 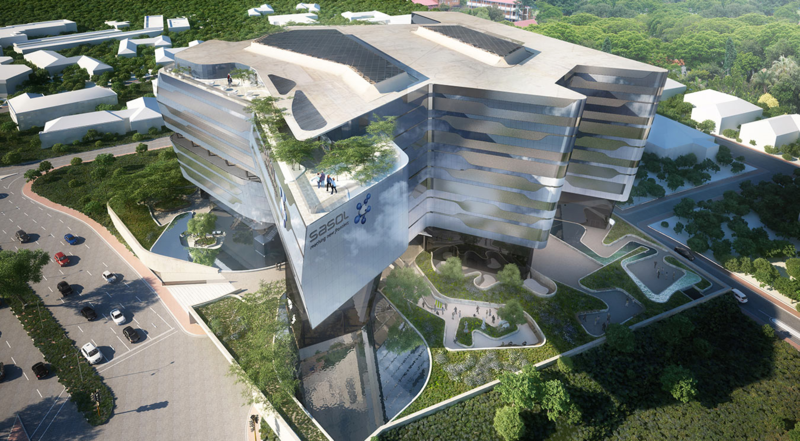 Sasol, one of the world’s leading integrated energy and chemicals companies, is building its new corporate office on Katherine Street in Sandton, Johannesburg. 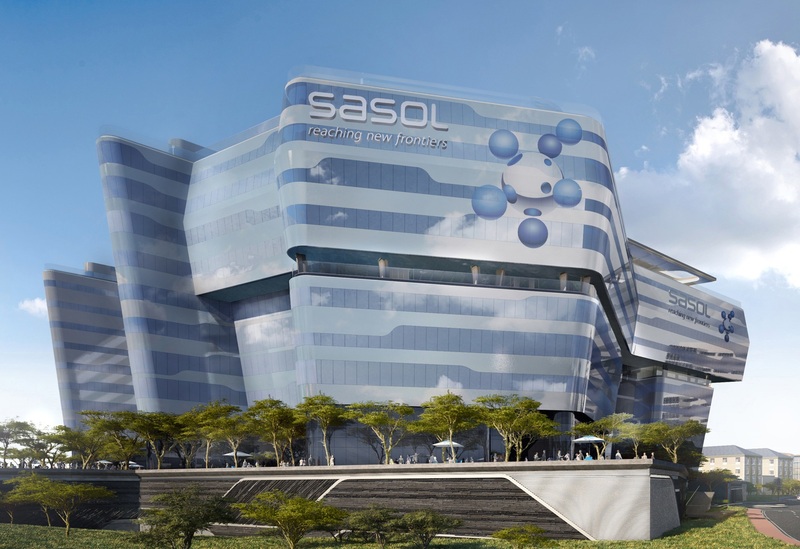 The vision for the new building was to somehow link the look of the new building to Sasol’s logo. The logo, which encapsulates the company’s values comprises of a central sphere which denotes stability, while six rotating spheres representing the ‘business units’ suggest a force greater than the sum of its parts – strength through synergy. Paragon Architects took up the challenge to make this logo a visual component of the design. To make the logo come to life, Paragon Architects studied the distilled essence closely to interpret it into built form. Sasol’s company structure was used as the departure point for the conceptual design of the building. The concept was initially set up as a straight line linking the various units. However this was seen spatially as too constrictive and so the form evolved into something more serpentine, which in turn generated a more humanist space and was more easily accommodated in the available space on site. A central core of work activities ties the building together and the various areas are linked by a series of bridges. The major challenge was the site on which this building will stand – a curving edge of Katherine Street. The architects had to ensure this 10-story building, that will serve as offices for up to 7000 people and span almost 70 000sqm could be accommodated and well-connected both vertically and horizontally. It was important for Paragon to push boundaries in this design, which is characterised by light volumes externally and two dramatic skylights (articulated with acoustic baffles) internally. These elements create a feeling of airy spaces and allow as much natural light into the structure as possible. The concept of open, transparent and remote work spaces is extended to embody the values of Sasol to include restaurants, canteens, art galleries, coffee shops and a Sasol One Stop Shop. The result is an external façade of reflective performance glass which has a high light transmission level and maximises visibility out of the building whilst maintaining a high comfort level. There are over 2000 panels of floor-to-ceiling unitised double glazed panels of vision glass and spandrels. The shapes and glass variations are encapsulated in each panel. The spandrels are a bespoke textured custom glazed unit, fired at 680 degrees with a silver backing, insulation and an aluminium panel; the glass is Safety Shield Imagin Krizet with Ipasol chrome coating. This glass has not been used in South Africa before and this project seeks to exploit its properties to its best advantage. In addition to glass performance, the building volumes have impacted on the design. Where sections of the building cast shadows on itself, the size of the spandrels reduce to allow more light through. Façade patterning has generated an environmental analysis and heat gain to reduce energy consumption and maximize user comfort levels. Externally the park-like staff facilities include courtyards and braai and yoga facilities with water-wise planted areas. Sasol is very committed to supporting birdlife in South Africa and this will be accommodated by providing an indigenous environment for birds. The landscaping has been designed to shade the façade, where heat gain is higher. On lower levels planting gets thicker.